The meeting is scheduled for 6 p.m. Feb. 19 in the first floor assembly room of the Town Lake Center, 721 Barton Springs Road. 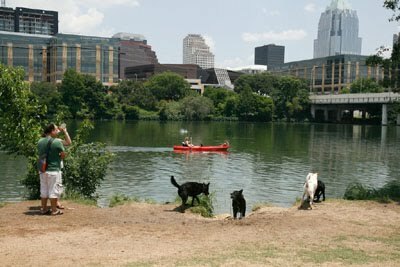 Austin’s Parks and Recreation Department is looking for community input as it prepares to make improvements to Auditorium Shores, and some people have already suggested that one way to improve the popular spot would be ending the leash-free zone for dogs, a department official said. Auditorium Shores is one of 12 Austin parks where dogs areallowed to roam unrestrained. Stuart Strong, acting director of Austin Parks and Recreation, said the department has heard from people on both sides of the leash issue. The department will hold a meeting later this month to hear community input about phases 3 and 4 of the Town Lake Master Plan (which covers Auditorium Shores), and while the emphasis is on improvements to the park, Strong said they’re happy to listen to input about the leash rules and other operational concerns. After getting a feel for public sentiment, Parks and Recreation will create a final plan to pitch to City Council.